I began reporting on crimes and murder trials as a TV reporter for the NBC affiliate in Fresno, California, KSEE in 1999. During the five years I spent in California’s Central Valley, I had the opportunity to cover a number of high-profile cases. Among them was the trial of Scott Peterson, who was ultimately convicted of murdering his pregnant wife Laci in 2004. Two years prior, I covered the trial of Cary Stayner, the hotel handyman responsible for a series of murders at Yosemite National Park. 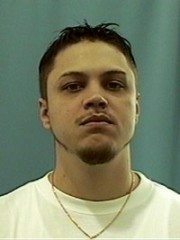 FRESNO,CA 5-20-2004 – Murder suspect Marcus Wesson. On March 12, 2004, I was among a small group of reporters who responded to the scene of a home in Fresno, where an apparent domestic disturbance had gotten out of hand. As the night progressed, I filed live reports from the scene, as the details of what would become Fresno’s worst mass murder, emerged. Nine family members would be pronounced dead by the evening’s end, as the patriarch of the family, Marcus Wesson, was escorted out of the house in handcuffs, covered in blood. From left to right are; Jeva St. Vladensvspry Wesson, age 1, Aviv Dominique Wesson, 7, Sedona Vadra Wesson, age 1 1/2, Illabelle Carrie Wesson, age 8, Marshey St. Christopher Wesson, age 1 1/2, Ethan St. Laurent Wesson, age 4, and Jonathan St Charles Wesson, 7. The image is scanned from the memorial program handed out at the funeral on Wednesday, March 24, 2004. 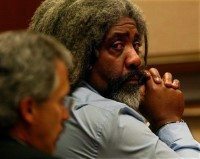 During Marcus Wesson’s murder trial, I secured permission from the judge to blog live details about the testimony, adding my observations from inside the courtroom. 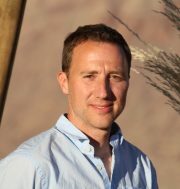 The blog became popular and a literary agent contacted me to ask if I had considered writing a book about the case. In 2007, HarperCollins published my first book, By Their Father’s Hand: The True Story of the Wesson Family Massacre. In 2005, I moved to San Francisco and after my first book was published, I continued to report on television, covering the news of the day. 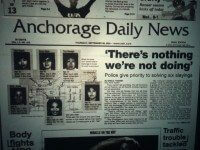 Then in 2014, while researching unsolved crimes, I came across an article in the Anchorage Daily News that piqued my interest. The article, dated September 28, 2000, had the headline: ‘THERE’S NOTHING WE’RE NOT DOING’ — POLICE GIVE PRIORITY TO SOLVING SIX SLAYINGS. The story recounted the killings of five Native Alaskan women and an African American woman whom had been murdered within the span of 16 months. 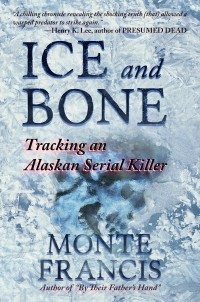 There was no clear indication the slayings were linked, but at the time, fear was spreading among the residents of Anchorage that a serial killer was on the loose. I had never been to Alaska, and the desolate and cold landscape appealed to me as a setting for a book. I was uncertain if I could uncover anything about the cases and even if I did, I was equally unsure if there would be enough material for an article, much less, a book. But I knew from past experience that taking risks was necessary; plus, my instincts were telling me that there was something there. I took a leave from my television reporting job and booked a one-way flight to Anchorage. Perhaps my biggest challenge during those dark weeks of winter I spent in Alaska was born out of my own ignorance. I had not considered the lack of sunlight at that time of year, nor what effect such constant darkness would have on me. I was in a dark place, investigating dark things, but my research was proving fruitful. Around each corner I was discovering another twist or surprise. One thing was becoming clear: All the paths I was on seemed to lead back to the same young, drug-dealing convict. 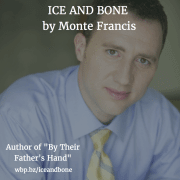 ICE and Bone became available April 19. Order your copy today! ICE AND BONE, published by WildBlue Press in April 2016, is the result of the year I spent looking into these cases. Please follow me on Facebook and Twitter and check out my website. I really appreciate the support!